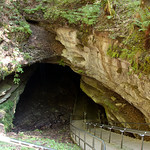 The feature for Day 2 of our road trip was Mammoth Cave National Park in Kentucky. We arrived mid-day, set up camp, ate a quick lunch, and headed to the Visitor Center to check out the tour options. Mammoth Cave has over 390 miles of cave – the longest known cave system in the world – so there are numerous tours for visitors to enjoy. These tours still only cover about 12 miles of the caves. We bought tickets for the Historical Tour as well as the Frozen Niagara tour. We had a bit of a wait before our first tour, though, so we caught half of an above-ground ranger talk about the pivotal role that enslaved persons played in the cave’s history. It was very interesting and informative, and turned out to be good background for the Historical Tour. Mammoth Cave is like the Grand Canyon of caves. It’s just really huge. As we learned on our tours, there really aren’t a lot of cool formations (stalactites, stalagmites, draperies, etc), except in one small section of the cave. But the history is pretty interesting – from gypsum mining by early Native Americans, to saltpeter mining during the War of 1812, to the tourist industry starting after that war ended. Plus, it’s a pretty neat place for a hike. Especially when it’s 94 degrees on the surface, and nobody in their right mind should be hiking. It’s always a cool 54 degrees inside the cave, so there’s little risk for heat stroke. The Historical Tour was about 2 hours and 20 minutes long. The tour group was ridiculously huge, and full of families with small children. That made it a little less fun. It’s challenging enough to walk through a cave – taking care to simultaneously refrain from hitting your head and from tripping or slipping on the rough yet slippery ground – without also having to be sure not to run over a munchkin. The most unfortunate part was toward the end when the park ranger shut off the lights to give everyone a sense of just how dark it is, and also tried to get the crowd to be completely silent for just 5 seconds to hear cave silence. That didn’t work out so well. But the tour was still really cool, and we even made it through the sections called “Fat Man’s Misery” and “Tall Man’s Misery”. We were really glad that we did the Frozen Niagara tour after that. 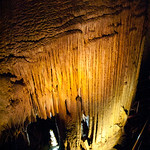 This featured the section of the cave that actually does have formations, so we got to see a few cool things. Plus the group was MUCH smaller, so we did have our darkness-and-silence experience. 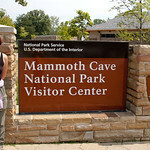 Overall, we were really glad we finally got a chance to visit Mammoth Cave National Park. If I were to recommend only ONE cave experience, I would suggest Carlsbad Caverns National Park in New Mexico over this one. But, this was still worth doing.